Direct vs Belt Drive Pressure Washers. When it is time for you to buy your new pressure washer, among the many variables to consider is the drive. Should you buy a belt drive or direct drive? This is one of the decisions our customers are faced with. In this article we will explain how each drive works and the pros and cons of each to help make you choose the pressure washer that fits your needs. 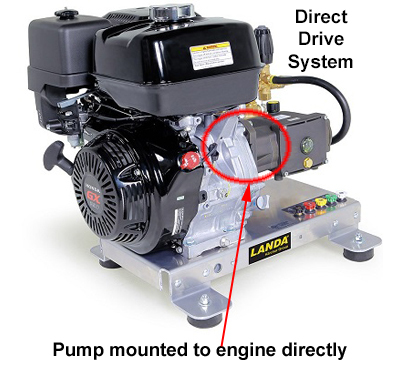 In direct drive pressure washer, the pump is mounted directly to the engine, whereas in a belt drive pressure washer the engine drives the pump by turning a belt. As a general rule, direct drive are less expensive than their belt drive counterpart. In casual or home use, direct drive pressure washers are fine, but industrial usage demands belt driven pressure washers for a variety of reasons. The weight of the attached pump places additional strain on the engine and the mounting bolts. Bolts will wear through, and even a minute amount of bolt wear produces additional vibration to the engine – which is detrimental to the engine’s life and performance. The most serious issue with direct drive pumps is the RPM (revolutions per minute) at which the pump runs. With direct drive the pump is coupled directly to the engine drive shaft and is turning at the same RPMs as the engine - around 3,200 to 3,400 RPMs production higher temperatures and vibrations. Anything that happens to the pump happens to the engine (and vice versa) – if there is a pump or engine seizure, the concussion will be passed on from the pump directly to the engine, or from the engine to the pump in the case of an engine seizure, resulting is major failure to the machine. 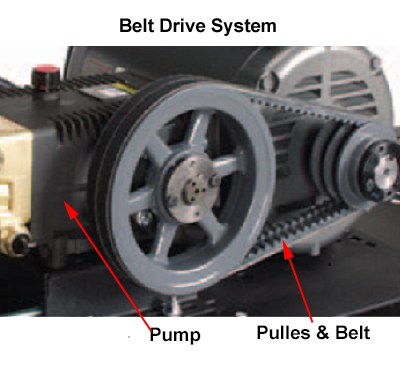 Belt drive pumps are driven by the engine through a pulley and belt system – no additional weight on the engine. This eliminates unnecessary stress on the engine. The pulley system on a belt drive pump reduces the RPMs to around 1,725 RMPs. This reduction in RPM keeps the pump’s temperature down to a level that greatly reduces damage from heat and wear from the high RPMs. Another advantage of having a belt driven system is that the pump is not affected by the engine’s vibrations, which in turn helps prolong its life. If your pressure washing is an integral part of your business a belt drive system is the right machine for you. You will experience much less down time and the savings in repairs will offset the initial price difference. The drive system is one of several variables available to you when you buy a pressure washer and at Williams Cleaning Systems our team has the industry knowledge and equipment expertise to help find the right pressure washer for your job.